I left my house this morning and thought “It’s kind of warm out here, almost balmy…. I am over dressed with this scarf and hat. Spring must be just around the corner!” Friends, it was 29 degress. Yes, that’s right, we have reached the point in the Chicago winter where anything above 25 degrees feels like springtime. Ten more degrees and people will start breaking out their shorts and tank tops. Obviously by now everyone around these parts is well acquainted with winter. Today in storytime our theme was snow. I asked the kids if they knew about snow and they replied affirmatively and let me know that it snows if it is winter, at which point one of my regulars told me he “is sick of snow and hates winter!” I really had to laugh and apologize for devoting a whole storytime to something he is completely over. Enough of my babbling, on to the storytime. We only had time for two books this week, I had a lot of other things going on that took up a lot of time. We read Chaucer’s First Winter by Stephen Krensky, illustrated by Henry Cole. I liked this book because it was your run-of-the-mill bear hibernates in winter story. (Don’t get me wrong I love those I did a whole storytime about them, but it was nice to have something different.) Chaucer is a curious bear and decides to stay up for winter. It’s a very sweet story and he luckily has two friends to pal around with as his parents sleep. We also read I Know A Cold Lady Who Swallowed Some Snow by Lucille Colando, illustrated by Jared Lee. I used a great flannel board today that I found on DLTK. This is a very easy flannel board to make, basically all you need is five snowflakes and a sun. You can be as creative as you want with these. I used our die-cut machine to cut out the shapes. I also made a sun to pull out at the end. If I had some sort of sun looking puppet, I would have maybe used that. Easy peasy and lots of fun. Two little snowflakes laughing with me. Four little snowflakes dancing a jive. We also sang a cute song that I found on Perfectly Preschool. This song was a great opportunity to get up and get moving. Watch my snow pal grow as up the Balls they go… 1 2 3, 1 2 3! For our craft today we made hats. I have said before my favorite crafts are the ones they wear out of the storytime room. It is just so cute. All this consists of is a hat pattern a piece of cardstock and some bands cut out of cardstock. Since I was so terrible about getting pictures last week I tried really hard to remember to snap a few shots this week. I had a really huge group (almost 30 kids!! Throw in their parents/caregivers and younger siblings and there were a lot of people in the room) so I was running around during craft making sure everyone was doing OK. 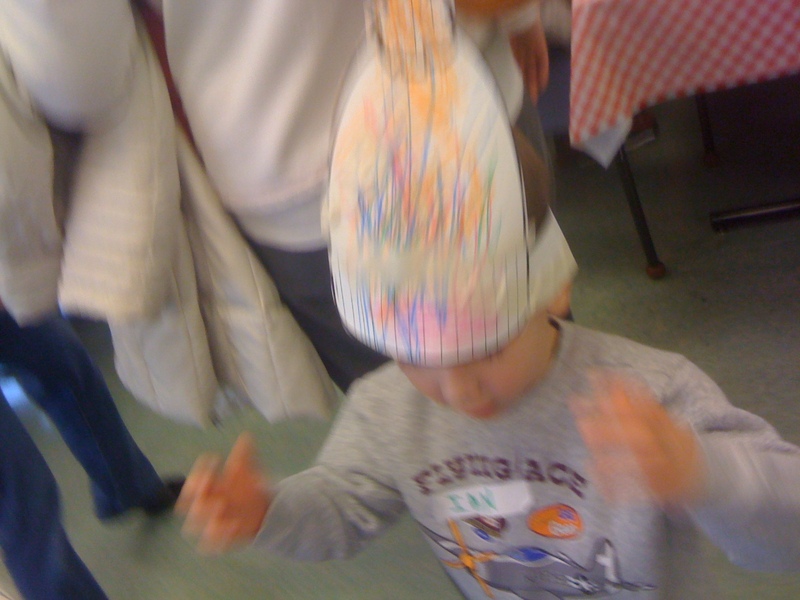 The next picture is a little blurry and not the best picture of the craft, but it is an awesome picture of one of my little friends enjoying himself. Storytime is finally back! It has been so long and I was really starting to miss all of my little friends. It’s the start of a new session (and new year) so I had a lot of newbies to storytime this week, which was great. I really hope they keep coming and having fun with all of us each week. Since it was our first week back, I wanted to do something super fun and I came up with dancing (who doesn’t love to dance??) This gave us a lot of opportunities to get moving. Since it’s winter and everyone has been stuck inside for so long, I thought this might be the perfect cure for some cabin fever. I must say, this was one of those storytime where everything fit together perfectly. The kids were all very attentive and into the storytime (always a blessing), the books were great and the craft was fun. A nice way to start out the session! We began with Brontorina by James Howe first. Little known fact about me: I took ballet for 10 years, ages 5-15. Because of this, I think I am always drawn to ballet stories. Regardless of why I initially picked up this book, it is super great! I read first because it is a bit long and had more going on than the other books. But, it was a hit with the kids. One boy liked it so much he checked it out right after storytime! Next we read Dancing Feet by Lindsey Craig. Funny thing, this was on my pile of storytime contenders and I never got around to talking about it. I LOVE LOVE LOVE this book. It’s really the type of book that begs to be read aloud to a group of excited and happy children. I like that it has a guessing element to it, that is always a crowd pleaser. I also cannot state enough how much I love the illustrations in this book. On a personal note, it’s been added to the short list of books I will be giving my nephew for his 3rd birthday this year. Yes, I like it that much. Finally, we closed with Hop Jumpy by Ellen Stoll Walsh. I love Ellen Stoll Walsh’s books. I think they could all be read in storytime. I really liked this one because of the beautiful illustrations of frogs. Sadly, my library doesn’t own it and it is out of print. I was so happy I could share it with my little friends, but it was a bummer to not be able to get it for our collection. Obviously, this is a great theme for lots of movement. We did The Hokey Pokey and I made sure to do other fingerplays that got them up and about. There is really no limit of songs and movement that can be used for this theme. It’s awesome because anything can basically fit in it. Our craft worked out wonderfully. We made dancing sticks. Ok, so a dancing stick isn’t really a real thing, but it is an awesome thing that is very fun to play with.I gave the kids tongue depressors (or craft stick depending on what you would like to call it)and crate paper and they glued (or taped) the paper on the sticks. Super easy and super fun. I have to apologize, I took pictures and then accidentally deleted them. So, no picture of the craft. Luckily it is really easy to imagine. While you are at it, imagine a group of four three-year-olds dancing and waving their sticks as they dance together. That is what happened at the end of this storytime and it was fantastic.